The gallery is pleased to present an exhibition of small sculpture and sumi drawings by vanguard artist, Hilda Morris. These pieces released from the estate include bronze maquettes that are studies for large scale public pieces. They date from the mid-1960s to the early-1980s. Also on view will be sumi drawings on rice paper. A Northwest master in her own right, she was influenced by referential form, the eastern aesthetic, nature and spirituality. She often incorporated universal symbols into her work as metaphor, in particular the circle, which can be read on several levels such as the cycle of life. A retrospective exhibition of Hilda Morris’ work is also on view at the Portland Art Museum, April 15-July 16, 2006. A 112 pg. catalogue published by Washington Press is available. Born in New York City in 1911, Hilda Morris studied at the Cooper Union and the Arts Student’s League during the 1930s. In 1938, she headed west to Spokane, Washington to organize a sculpture program for the WPA. It is here she met Carl Morris, Clifford Still, Mark Tobey, Guy Anderson, and others from the Northwest School. Described as an abstract expressionist she also incorporated intellectual ideas of the day grappling with monumental themes in Western art, myths of the past and an interest in surrealism. Her style is metaphoric finding not just one meaning within a piece but the richness of alluding to many. 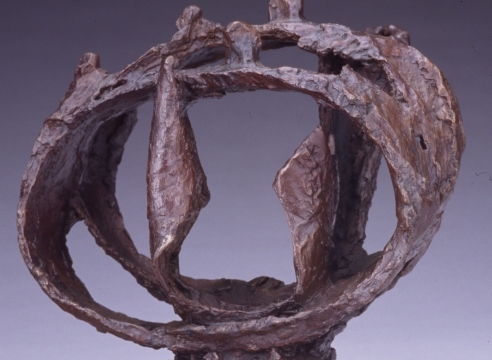 She took herself and her work seriously, excelling at her craft and maturing as an artist in the early 1940s while holding her own in the male dominated arena of sculpture. She explored the figure and the landscape translating and trans-mingling these elements into abstract, mythic form. Inquisitive and a voracious reader, Hilda Morris collected up references; music, nature, the sea and shore, people and relationships. Her spirituality encompassed the vastness of life and experience and turned the mix into something existential and sublime. She worked steadily searching and creating until her death in 1991.